Today’s recipe is yet another instant dish which can be served for breakfast, snack or dinner . It tastes good and is healthy in its own way. I am a person who loves instant recipes. Enter the kitchen, finish off your work and come out. But there is one more thing I want rather than finishing my job fast. Make the dish healthy. 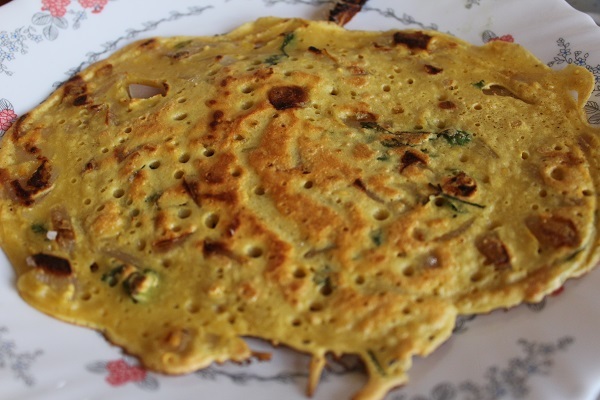 So this is one easy and healthy dish made with besan or gram flour as the main ingredient. This is a super fast recipe and can be made in very less time. There is no need of any grinding or fermentation. You can add grated vegetables to make it more healthy or add some sauteed vegetables in between and roll it, that also tastes great. Now to the recipe..
1. Chop onion, curry leaves, coriander leaves and keep it separately. 2. 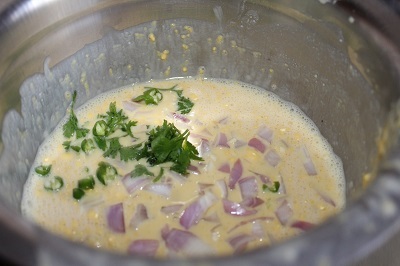 In a bowl, add gram flour, rice flour, rava, cumin seeds, chopped onion, curry leaves, coriander leaves and mix well. Before adding ajwain, rub it between your fingers. 3. Then add asafoetida and salt. 4. 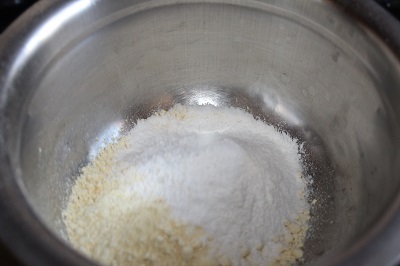 Add water slowly to make a smooth batter. 1. Heat a tawa. 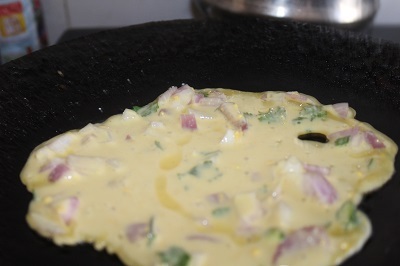 When tawa is hot enough, pour a ladleful of batter on to the tawa and spread it with the back of the ladle. 2. Pour 1 teaspoon of oil around the edges. Let it cook on medium flame. When one side starts becoming brownish in color, flip it to the other side. 3. Cook this side also in medium heat and press nicely with the back of the spatula so that puda gets cooked evenly. 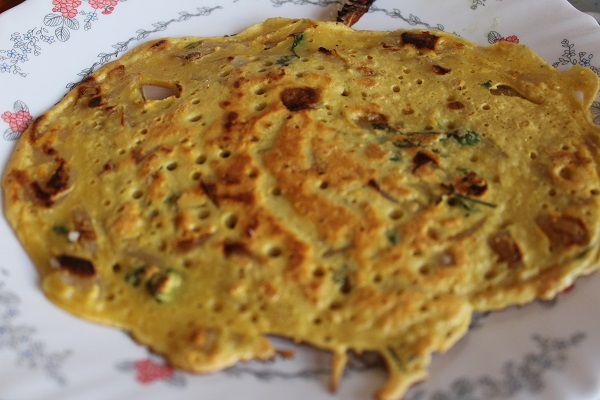 (Besan takes long time to cook, if not cooked properly, the taste won’t be nice.). Wait till this side also gets brownish in color. 4. 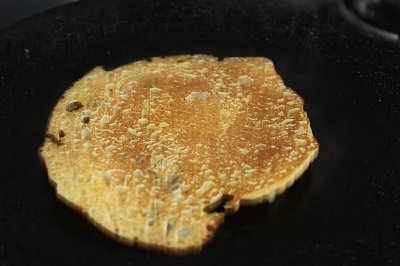 Flip on both sides, press nicely so that dosa becomes slightly crisp. 5. Transfer to a serving plate. Serve with yogurt, chutney or pickle. 1. Try adding other grated vegetables like carrots, cabbage or finely chopped spinach. This will increase the nutritive value and also the taste.